Our girl is half a year old! Where has the time gone? Where has the money gone? Well, I know the answer to that second question at least. This month was a more pricey one for the OFB baby, to be sure. Our girl is still just nursing, so we’ve yet to spend any money on baby food. Although, Johnny can attest that I probably eat more as a nursing mom than I would otherwise, so maybe in a way we have spent extra on food for her. In preparation for eating solids soon, Baby Girl has begun the teething stage, which has meant purchasing teething rings ($4.00) and Infant Tylenol ($6.00). And because it’s summertime, and our girl wants to be outside as much as possible, we’ve had to buy swim diapers ($10.00), a sun hat ($4.00 at Old Navy in the boy’s section! ), and sunscreen ($7.00). Unfortunately, I’ve learned that slathering Baby Girl in SPF 50 has done nothing to deter complete strangers from commenting, “You’re baby’s [legs/arms/cheeks] are getting burned!” Luckily, they’ve yet to be right, and I’ve somehow managed to just smile each time, so we’re doing all right. This month has also brought with it the purchase of a new baby carrier. We were gifted the Baby Bjorn by a friend, and we’ve loved it, but Baby Girl has grown out of it already! Have we mentioned that she’s still 99%-ile for height and weight, so at least she’s a proportionate little snuggle monster :). So we bit the bullet and purchased this Ergobaby Performance Carrier ($108), which we feel like is an investment that can be used with future children as well. And we used a gift card for half of the purchase to help lessen the blow a bit. 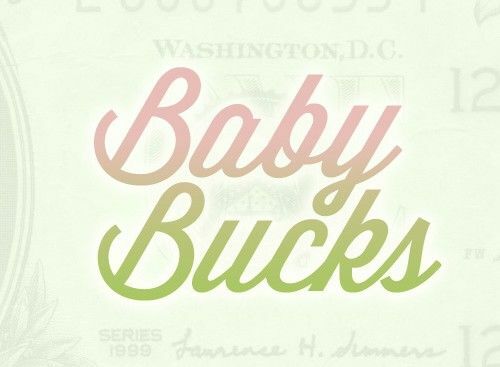 We also continue to spend close to $50 on diapers and wipes each month and Baby Girl had her six-month check up recently ($15 copay), so our grand total for baby expenses last month comes to $204. I feel like this is the age where parenting really starts to get fun. If I’m being 100% honest, the first three months were quite hard. But since she’s turned three months, our little girl’s personality has started to shine through, and now it’s bursting at the seams. She puts her arms out for us and looks at me and smiles every time Johnny says, “Where’s mama?” And she knows her name when we say it! She’s sitting up and trying to grab and eat anything and everything. One of her most favorite activities is drinking out of my water bottle, which is adorable, but also kind of gross because of all the drool she leaves behind. Her hair is finally starting to grow, but she’s still gotten a couple “Hey, little guy!” comments from strangers. We’re so in love with our little girlfriend. 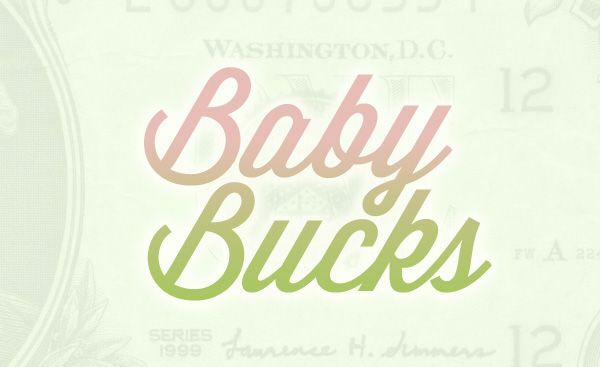 Finances should definitely be considered before having a baby. But I’m telling you right now, every time we see our girl smile, it’s worth a million bucks. My goodness!!! You guys certainly do have the cutest little chunk in town! What a beautiful babe. I’m starting a new job (in a new city!) nannying for two 5 month olds this month, definitely loving these posts to give me a bit more knowledge about what to expect from these adorable little ones! Precious pics! Every month is seriously more fun than the last with a baby…I say this to my husband every month! You will have those expensive months here and there . Right now our 1 yr old is eating more than me! So she’s really putting a dent in grocery budget! Ihighly reccommend now that she’s 6 months infant ibuprofen…our poor girl gets 3-4 teeth at a time and ibuprofen works so much better and longer. Also for teething toys there is this toy called Razberry ($5ish)that looks similar to a paci and helps a lot. You guys continue to do really well at keeping your expenses low! My husband and I haven’t yet started a family, though it’s been talked about – by our respective families – many times! 😀 But these posts are great and are wonderful for future reference – it is really nice to know what we could expect to add into our monthly budget once a little one comes along. Thank you for posting, and for the pics of your adorable little girl! Hahaha. That’s what families are for, right? Thanks for reading. She’s so cute. The 6-9 month age is still one of my favorite stages with our little girl… now she’s 2 years old. Time flies! Take a million pictures, then take a few more. My wife nursed for 12 months and we didn’t use (nor have we ever) a drop of formula and I felt like we saved a ton of money while doing so; however, I didn’t think about the extra food she was eating so I wonder if it does run about the same both ways. Very cute and adorable baby girl. Just like other stranger, I would still think that she’s a guy because of her hair. Time flies so fast, I just remembered that I’ve been reading your blog for quite sometime now (roughly 2 months and a half?). Wow. I barely noticed it. Such a cutie! Great pictures! Cool points for purchasing the Ergo. It had a big price tag but I’m sure I wouldn’t survived this long without it, and super especially enjoy not having to bust out a stroller for walkable trips or tidying up around the house – even washing dishes! Our 18 month old, 30 lb-er is still super comfortable and not a backache for me. Good budget-friendly and long-lasting investment! Hooray for joining the cool club! We were tired of lusting after fellow parents that strapped their kids up like a backpack, so we finally splurged. And hopefully the investment will pay off as well for us as it has you. I love the pictures and hearing the updates. My wife and I don’t have any kids yet, but we probably will soon so it’s nice to hear about the costs. That will help us prepare for it a bit more. Your little girl is so adorable. I’ll be interested to see how well you like the Ergo. I am debating about getting one, once I can no longer get my little guy in the Moby. The verdict is still out. She’s not a huge fan of getting carried on our backs yet, which was one of the main selling points for us. But she’s still got plenty of time to grow and she’s still barely able to cram into the Bjorn, so we’re covered for now. But we’ll update you after a few months and see if it was a worthy purchase/investment. Great six month update! Our little guy just turned 6 months and we are dealing with many of the same as you. The expenses are up and he has started to eat cereal, which is fun, yet very messy! 6 months is AWESOME! That’s when our little guy started to show TONS of personality as well. We’re at 18 months now, and he’s just a freaking blast! SO adorable! Our Maddie was consistently 95-100% in height and weight too, so I know whereof you speak. Yeah, the 6 month age is a good one, and it only gets better from there, although you’re right – it goes SUPER fast. 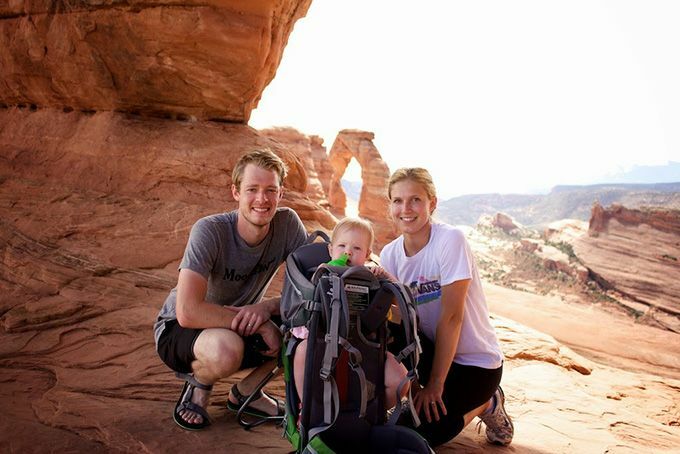 I think you guys are doing great with expenses too – the baby carrier was a wise purchase – you’ll definitely get your “cost per use” value out of it and be able to sell it well when the time comes to sell it. Keep up the great work – you guys are doing terrific! I can’t wait to meet little Baby G. in October!! She’s just too cute for words. She looks sooo happy. It reminds me of when we had our two little “rug rats” many moons ago! Now each of them have kiddos of their own (and the drama of raising them). Karma, I say! We had our “Little Girl” and later a “Little Boy” only a few years apart so, when very young they used to happily play with each other and share many of the same interests. Of course, like you guys, we took a gazillion pictures of our Little Girl but not as many of our Little Boy. I guess the whole baby newness thing had worn off a tad by then. So cute You will love your Ergo, I have a Beco- almost the same, and so happy with it. Enjoy! Good to know on the Advil advice. We will take any and all shared wisdom we can get. Thanks! #1. Your little girl is adorable and clearly getting great nutrition – go mama! #2. Excellent choice on the Ergo. Worth every cent, in my opinion. #3. Do yourselves a financial favor (and one for the environment at the same time) and get a reusable swim diaper! iPlay (http://www.iplaybabywear.com/iplay/swim-sun/swimwear.html) makes great ones that we have used from birth with our son. Never had a leak in our 22 months of use. They dry quickly, so just use, rinse in warm water unless truly dirty, then dry in the sun. 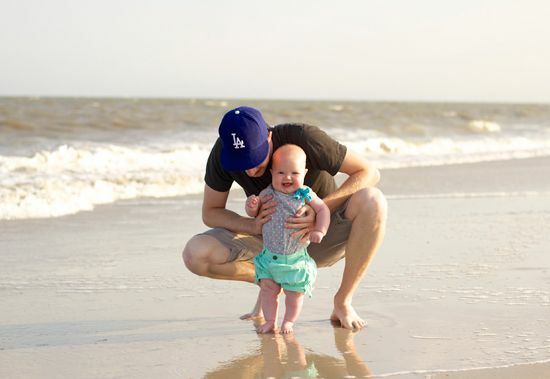 Trust me, you will never go back to disposable swim diapers. Awesome suggestion on #3. We might be nearing the end of swimming season in the next month, but we’ll definitely look into it for next summer. Those disposable ones are pricey! Awwww I remember when my little ones were that age and just as chunky! Pure love!